I have been meaning to write about my hydroponic system for a long time. Its Sunday now and there is lot of pending work for Monday at college, but nevertheless I have postponed long enough. My interest in hydroponics was sparked by my brother who bought a kit and attempted to grow spinach. I continued his efforts. 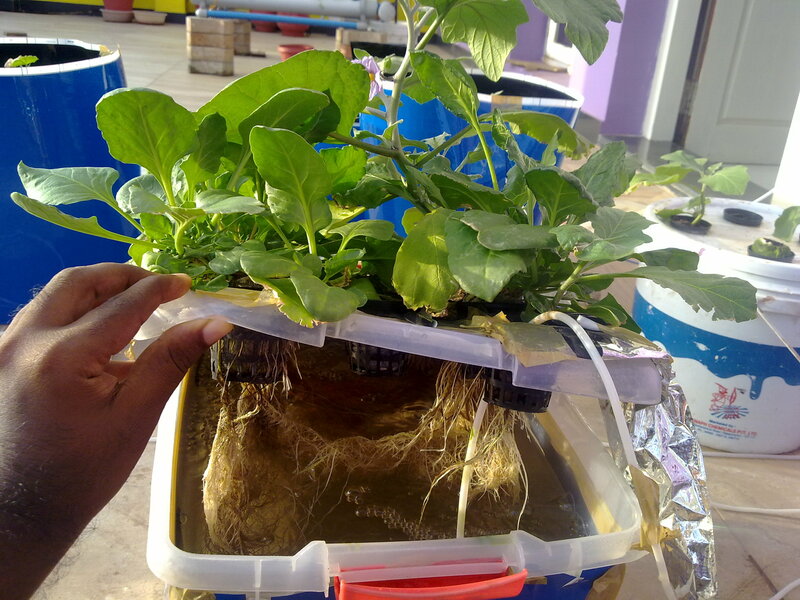 Hydroponics is a soiless method of growing plants using mineral nutrient solutions. Plants require these major nutrients – nitrogen, calcium, potassium, phosphorus, sulfur and magnesium and the following micronutrients in trace quantities– iron, molybdenum, manganese, copper, boron, zinc and sodium. In hydroponic system, they are fed in the form of salts like calcium nitrate, potassium phosphate etc. In soil microorganisms breakdown organic matter into these salts, while in hydroponics and fertilizer based agriculture, we provide the salts directly in optimal concentration. Also, the nutrient temperature, pH of the nutrient solution, oxygen levels of the solution(for root respiration) are controlled. Finding the right balance to get high yields is the challenge. 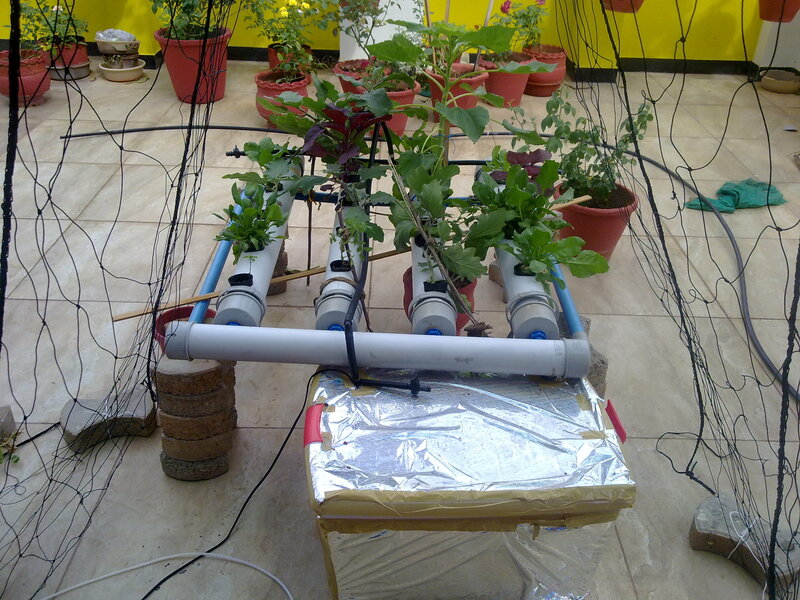 There are many hydroponics systems. 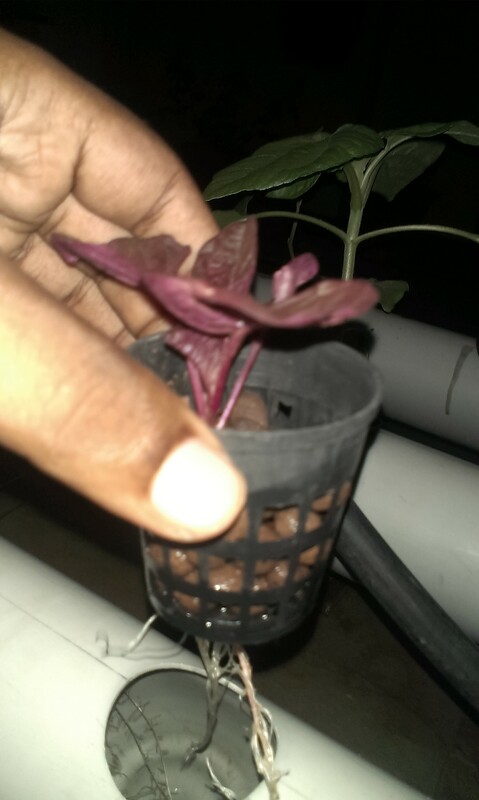 I tried Deepwater culture, Nutrient Film Technique(NFT) system and Kratky system. I am going to give an overview here and detailed blog posts on individual systems later. Four essential things are required to control the system – Total Dissolved Solids Meter(TDS) to measure the nutrient solution concentration, pH Meter, pH up(potassium hydroxide) and pH down(phosphoric acid). This involves immersing plants in a tub containing nutrient solution. The nutrient solution is aerated by means of air pump which is used for fish tanks. 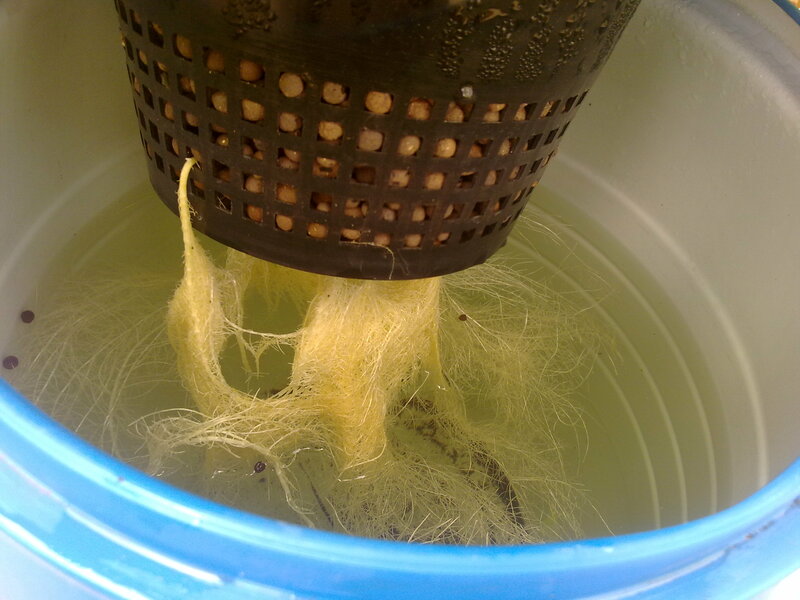 The plants are placed in net pots which are placed in holes drilled in the tub. They were exposed to 4-5 hours of sunlight. 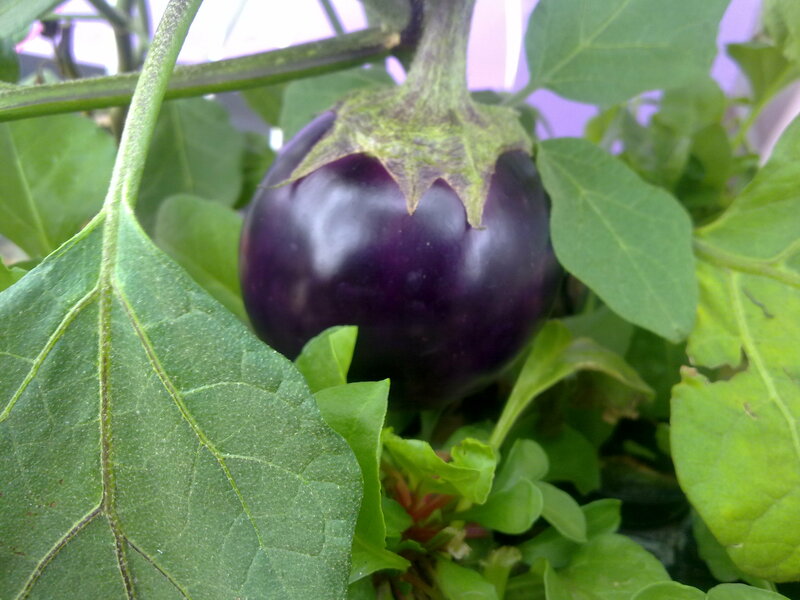 The plants that I grew are eggplant and palak spinach. 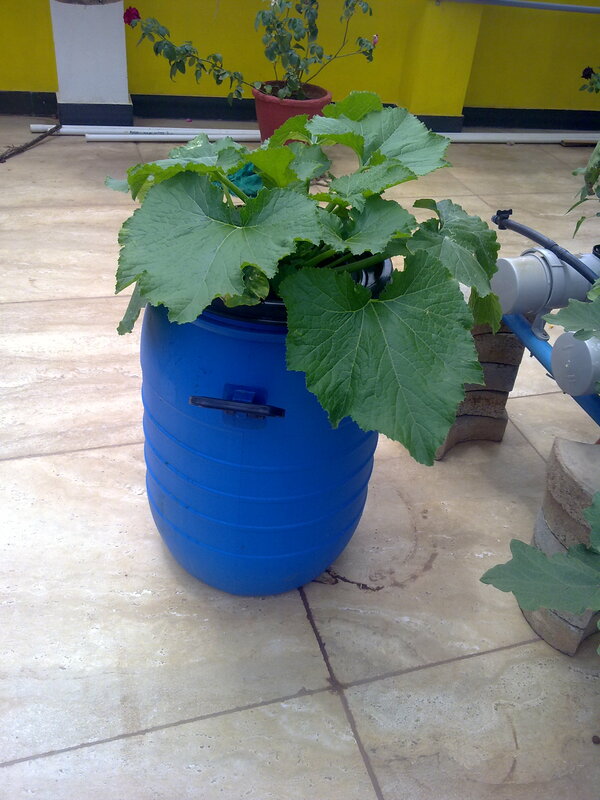 My initial aim was to get the plants to survive and grow in the hydroponic system and then think about getting fruits. The plants managed to grow, although the roots weren’t 100% healthy and has pythium root rot. Some plants died too. It wilts during peak sun initially and the temperature rises to 32OC. I kept the nutrient solution concentration at 800ppm and pH was maintained between 5.5-6.5 by using phosphoric acid or potassium hydroxide whenever necessary. I covered the tub with gift wrapper to avoid light from entering the tub and resulting in algal growth. The hydroponic solution I used first was called as ‘grow’ solution which had lot more nitrogen than phosphorus or calcium. 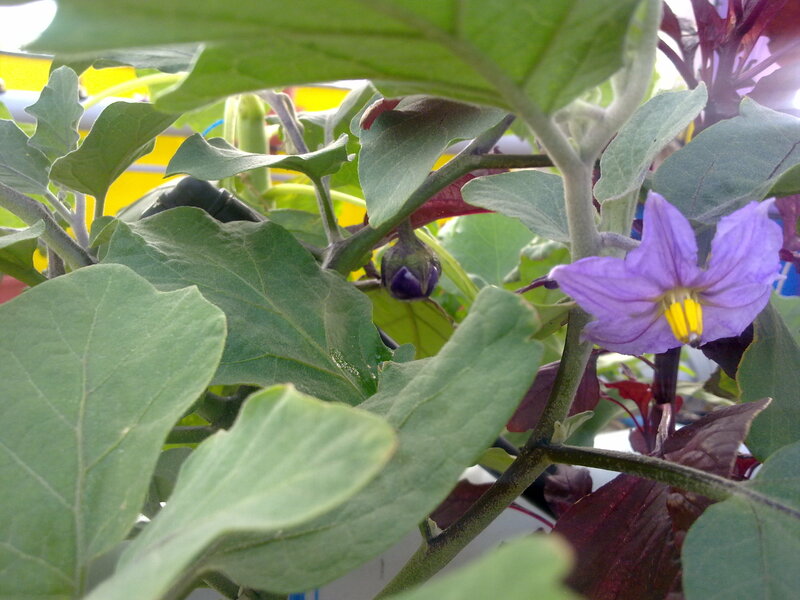 Later as the eggplant plant bloomed, I used the ‘bloom’ solution. It has less nitrogen compared to potassium and phosphorus. 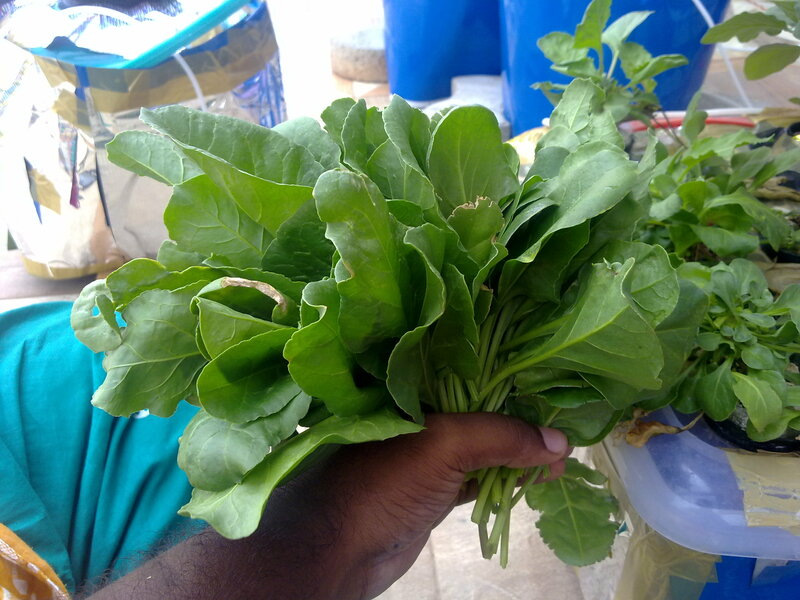 However, the growth of spinach slowed due to bloom solution as it contained lesser nitrogen then grow solution. I had wanted to grow only spinach, but then later changed my mind and tried to test two plants at once. The nutrient solutions were bought from gardenguru.in. The eggplant finally gave fruit and I got a bunch of leaves from spinach. This one consists of 3” PVC tubes with water circulating in them. Holes are drilled in the PVC tubes and netpots placed in them. Nutrient solution is filled in a big container. A submersible pump placed in the container circulated the nutrient solution through the system. The circulation keeps the solution oxygenated so that roots can respire. In this system, I threw in a lot of plants – eggplant, palak spinach, amaranthus spinach, some flowering plants, rose and even sunflower. All the plants were germinated separately in cocopeat plugs. This system started off disastrously with lot of spinach plants dying for some unknown reason. I replaced them with new plants which included eggplants and sunflower. Two of the four eggplants that I placed survived while remaining died due to poor root oxygenation. The water flowing in the PVC pipe probably had stagnant layers down in the tube, hence I added a spaghetti tube siphon to circulate the lower layers too. After this the eggplants showed some improvement. 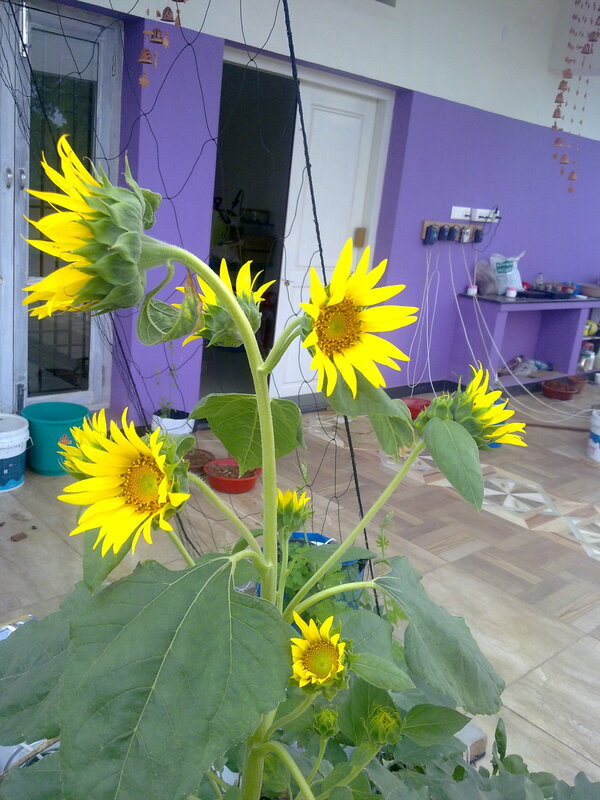 The sunflower was a big success, it didn’t seem to have any root issues and it grew and a I got a bouquet of sunflowers! Rose didn’t fare well though. The spinach was fairly okay, but when I shifted the system into bloom solution after the eggplant and sunflower started flowering, spinach didn’t grow very well and leaves were wrinkled looking. The nutrient concentration used was 800ppm during growing stage and 1100ppm when sunflower flowered and back to 800ppm after it finished. pH was maintained between 5.5-6.5 by using phosphoric acid and potassium hydroxide whenever necessary. The nutrient solution temperature touched as high has 34OC. Need to experiment and find plants that suit my environment. 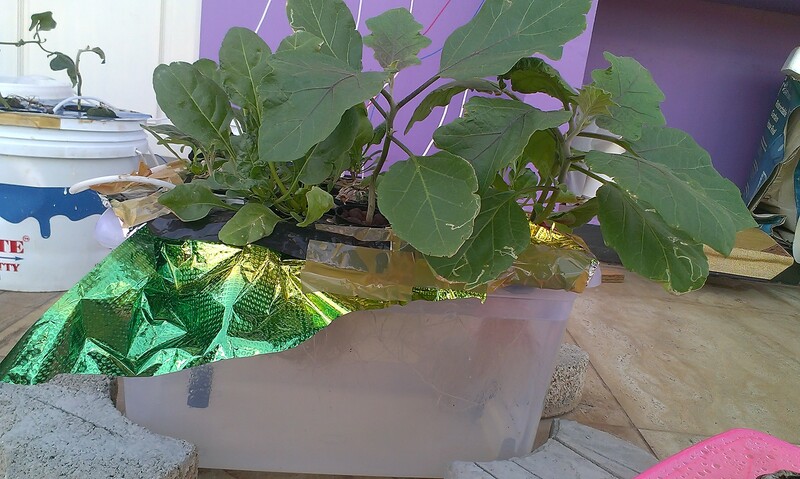 Kratky system is one where the plants are immersed in water solution without any circulation or air pumping for aeration of root zone. In this system, I tried zucchini in a big 50 liter barrel. It was germinated in a cocopeat pod and then placed in a big orchid netpot and placed in the container. It grew well and the root health was perfect. Here are the pictures. I tried to grow tomato in kratky system too, but it was not successful. I hope you enjoyed this demonstration of my hydroponic system in pictures. I will be back with detailed info on each plant type and two other plants – bitter gourd and cucumber. Dabbling in Hydroponics by Solarii knight Anand is licensed under a Creative Commons Attribution 4.0 International License.